This men's watch from Seiko combines elegant style with their signature technology. This solar powered watch has a sophisticated navy blue dial complete with date box, and is given a sleek look with a stainless steel case and matching bracelet. Water resistant to 100 metres. 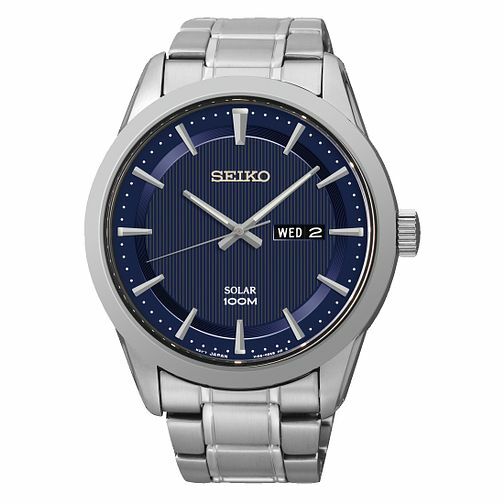 Seiko Men's Solar Navy Dial & Stainless Steel Bracelet Watch is rated 4.7 out of 5 by 3. Rated 5 out of 5 by Anonymous from High quality product and excellent service The product description was detailed to provide a realistic picture of the product. Great quality for a really discounted price, coupled with excellent service delivery.